The diversity of Indian cultures is well-known even in the farthest of lands. And with the diverse range of cultures, the brides of India are adorned with an assortment of attires and jewels which are difficult to find anywhere else in the world. Though it’s almost impossible to include all the brides of India here, we have chosen the ones which more or less define the attires of their own and nearby regions. 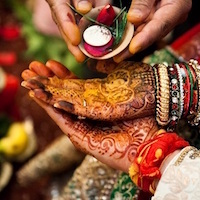 You can identify the Kashmiri bride majorly by two distinctions. One, she wears a cotton lined cap called Kalpush covered by a cloth called Zoojh and the typically Kashmiri earrings called Dejharo. The Kalpush is called the Kasaba by the Muslims of the region who wear a traditional dress called Pheran for their wedding while the Kashmiri Pandits prefer the Lehenga. The mere mention of Punjab fills in a vibe of fun and frolic within us. Such is the aura of the Punjabi bride as well. The majority of Punjab’s population belongs to the Sikh community and the brides wear their traditional Salwar Kameez for their big day. The tradition of wearing kalire (and the fun custom that follows it) on weddings also comes from the state of Punjab. Shivani Abhishek Aggarwal from Delhi is the perfect portrait of a North Indian Bride. Mesmerizing Beauty! 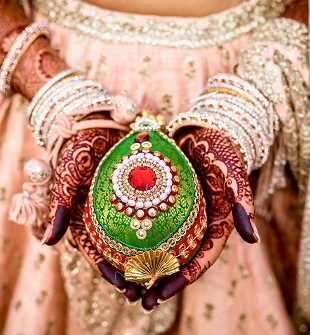 The North Indian Hindu bride is adorned with the sola singhar ornaments according to the Hindu tradition. The sindoor and mangal sutra completes the singhar, once the ceremony is done. Most brides prefer a Red Lehenga as the colour is considered to be auspicious for the occasion. In a ceremony called Leilunga, the bride makes the wedding garlands herself. Sumitra Thoidingjam looks ethereal in her traditional Manipuri wedding attire! The Manipuri brides wear their traditional wedding dress fanek and chader for the wedding. Manipuri weddings are full of colours and traditions, and so is the bride’s dress. The Manipuri bridal dress among our brides of India is one of its kind and is special in its own unique way. For the wedding customs, the bride wears a traditional potloi which takes hours to put on and is quite challenging to manage. The Bengali bride is one of the most popular donning her Benarasi saree with golden zari work on it. The kumkum on her forehead and the mukut (crown) are two significant adornments of the Bengali bride along with the traditional way of draping her saree. A Gujarati bride getting ready for her big day! 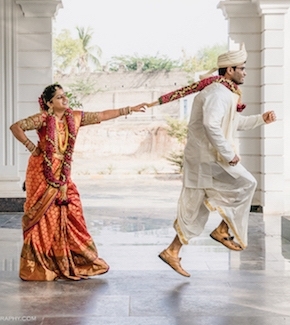 Gujarat is one of the few places where the bride wears white on her wedding. The embellished white saree with red border called Panetar is draped in Gujarati fashion and is worn along with gold jewellery. Some of the brides also wear the Garchola, a red bandhini sari crisscrossed with woven gold squares, enclosing bandhini motifs. The Maharashtrian bride wears the customary Paithani or Nauvari saree for her wedding. The Marathi nose pin is something exclusive about the Maharashtrian bride along with the traditional head gear called Mundavlya, which is worn both by the bride and the groom. The South Indian bride is popular mainly for the layers of golden jewellery she is covered with along with the beautiful hair-do created with flowers and other accessories. The attire is mainly a saree worn in south Indian fashion. The color of the saree depends on the community of the bride or on individual choices. Shagufta Khan's make up and attire had the true essence of a Muslim bride. Courtesy: NDTV Good Times. The beautiful bride Nida Mushtaq with accessories and make-up to the point! The beauty of the bride is in her inner charm and to say it without words, we have Anusha Halim's photograph from her Nikah Day! Though the Muslim Bride follows the same culture irrespective of the state she belongs to, it would be wrong to say that they are entirely similar. There are certain deviations influenced by the culture around. Traditionally, the bride wears a gharara and the jhumar is one of the significant accessories original to the Muslim bride. Jamthianhoih in her send-off dress, ready to bid farewell to her family! Two words: Subtle and Splendid. Same goes for the Indian Christian Bride as well. She follows the same lines as of western Christian weddings. Mostly the bride wears a white or light coloured gown and walks down the aisle with a bouquet in hand. It’s probably one of the simplest wedding dresses but the beauty in its simplicity is unmatched. After the wedding ceremony, the bride is dressed up in her 'Send-off' dress for the customary farewell ritual. The brides of India are known for the dresses and accessories popular within their culture. But with the world being more progressive and open minded, now brides also prefer to experiment things from other cultures as well. And, why not? In fact, that’s what makes India beautiful (and the brides of India), doesn’t it?